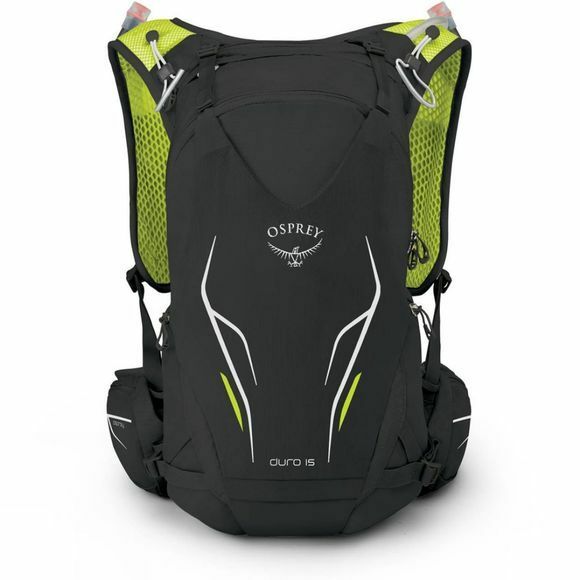 Osprey has renowned the attention to detail to the Duro 15 with an uncompromising range of features to prove a phenomenally high-performance running pack. The design of Duro 15 is a large capacity running pack designed to support distance athletes who require the space to hold clothes, water, food and equipment. With Multiple stretch mesh and zippered pockets on the front of the vest and hipbelt allow for easy, on-the-move access to nutrition and equipment. 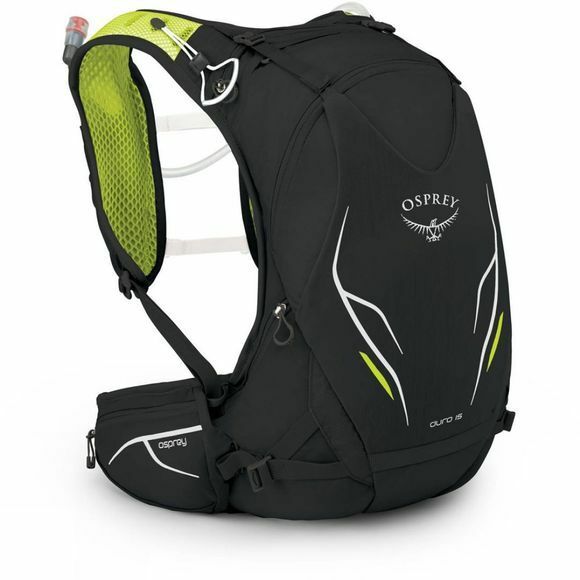 For extra comfort when carrying the pack Osprey have added a body wrap hipbelt and vest style fit for a comfortable carry to avoid any bounce. There is contact mesh at the back of the pack to allow free flow of airflow for breathability. Multiple stretch mesh and zippered pockets on the front of the vest and hipbelt allow for easy, on-the-move access to nutrition and equipment. The upper vest pockets contain two 500ml soft flasks with extension hoses, which can be swapped in and out, to save you the time from going inside the pack to get your flask out. The body of the pack contains a 2.5L Hydraulics™ LT reservoir, allowing for a total of 3.5L of water to be carried. To help give you the best and close fit the Duro 15 has compression straps that you can adjust so you can stay comfortable whilst on the move. At the rear of each shoulder features a Stow-on-the-Go loop, which can comfortably and efficiently carry trail running poles, to keep them away and allowing you to keep your hands free. The sternum straps are removable and adjustable, with a single hand release, as well as being elasticated so they don’t inhibit deep breaths or energetic movements.